Whether it’s a startup or an enterprise company with more than a thousand employees, most businesses today struggle with one thing that directly or indirectly has an effect on overall revenue: collaboration. Collaboration plays an important role in increasing productivity. There is no single department that works alone and no employee who can work completely independently. At Zoho, we have had a long struggle with collaboration. With more than 5,000 employees and offices in India, the United States, China, and Japan, communicating was difficult enough, let alone collaborating for work. Collaboration has to be real-time and all-encompassing. People should be able to share files and make audio/video calls when they need to. Users should be able to view and share any type of information, right from their chat window. For example, if my manager wants the stats from last week’s email campaign, I want to be able to view those stats and share them without even changing tabs. Leaving the chat window to find the file in other software, download it, and share it again is a waste of precious work time. At Zoho, we’ve always believed in automating mundane tasks and making life easier for our customers. It’s not just about making life easy, but about saving working hours wasted searching through old emails, files, and links. To eliminate these hardships and to make work happen, we decided to create our ideal messaging software. Introducing Cliq, our latest addition to the Productivity and Collaboration suite of products. 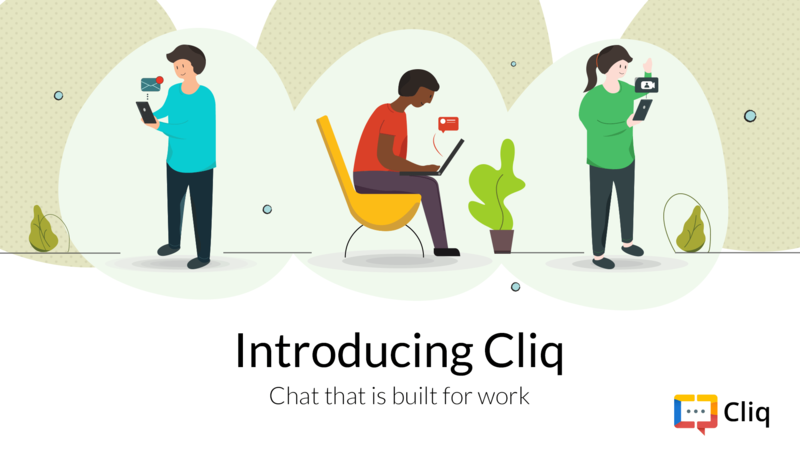 Cliq is real-time messaging, file sharing, audio/video call-making software built for work. 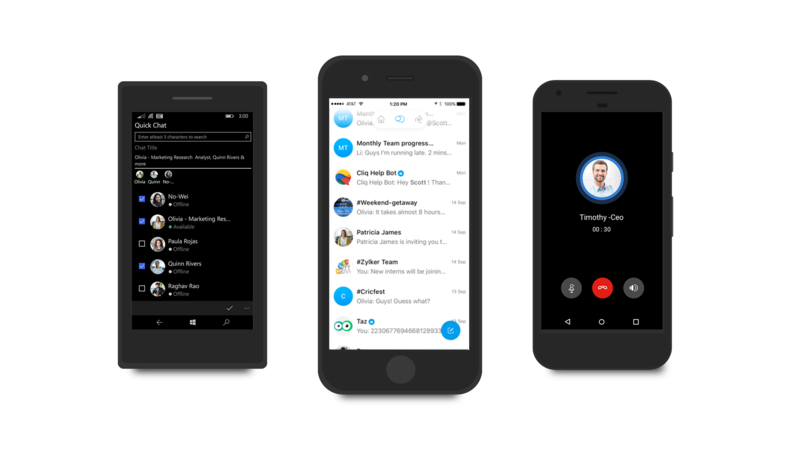 Real-time messaging and file sharing – Real-time messaging between team members and departments allows for instant decision-making. Files of any format can be shared in the chat window in seconds. Public and private channels – There are group channels, official team channels, even channels for company-wide announcements. Create as many public and private groups as you need. 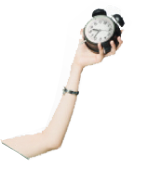 Audio and video calls – Users can start an audio/video call right from their chat window. 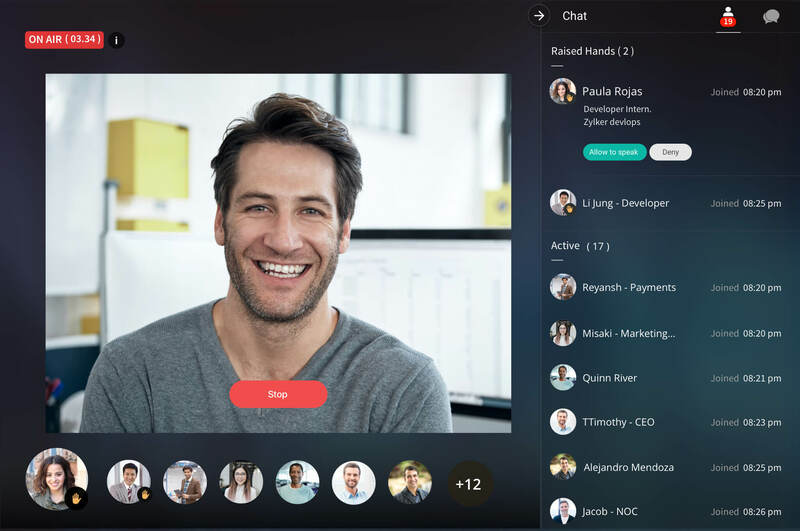 Primetime is a group video calling feature built exclusively for teams. Secure and searchable chat history – Business chats contain crucial and confidential information. Apart from being highly secure, Cliq’s advanced search lets you search and find any file or piece of text in your chat history, so you have easy access to it when you need it.. Integration with other software – Cliq comes integrated with most Zoho apps and a lot of other applications you use at work everyday. The simple scripted answer machines that we knew as chatbots are long gone. With Cliq, you can create useful, sophisticated bots that not only fetch information for you automatically, but can also perform actions like pushing/updating data to your online tools. Further, Cliq comes with a lot of features for automating mundane tasks. Commands: Shortcuts that you can use to perform your everyday tasks faster. 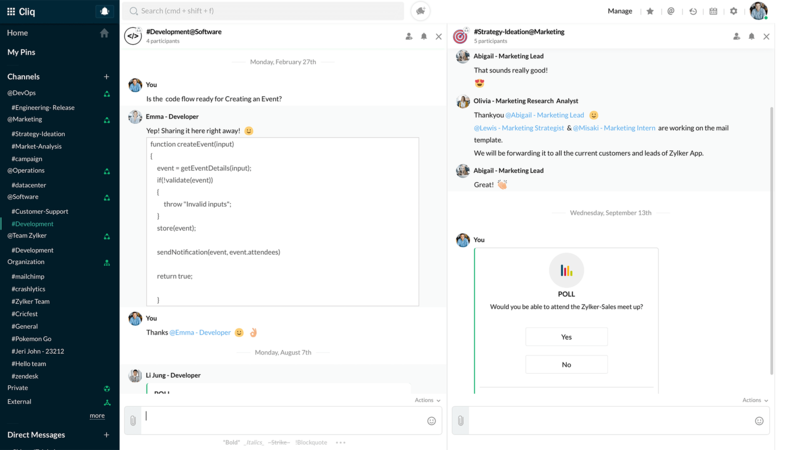 Message actions: Create your own options for your chat window. For example, you can include “Add to Google Drive,” along with other options like “Reply,” “Copy,” or “Forward’”. Functions: With functions, you can create buttons in your chat window to perform actions in other integrated apps. For example, you can create a “Send Campaign” button to send an email campaign through MailChimp. Bots: With bots as your virtual assistants, you can automate boring tasks which could otherwise consume hours of your workday. From fetching daily news, to gathering reports on your sales, bots are there to help. Cliq has a free plan that offers all the features an organisation would need. The paid “Unlimited” plan comes at $3 per user per month. 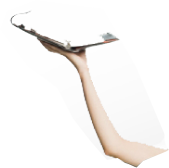 Mobile apps are available on iOS, Android, and Windows platforms and native desktops for OS X, Ubuntu (64-bit) and Windows (64-bit), for free. Try Cliq now and let us know what you think. We would love to hear from you!